I would definitely recommend this star motif quilt to anyone interested. It has beautiful colors and fits my oversized bedding perfectly. It is the perfect compliment to my other floral accessories. 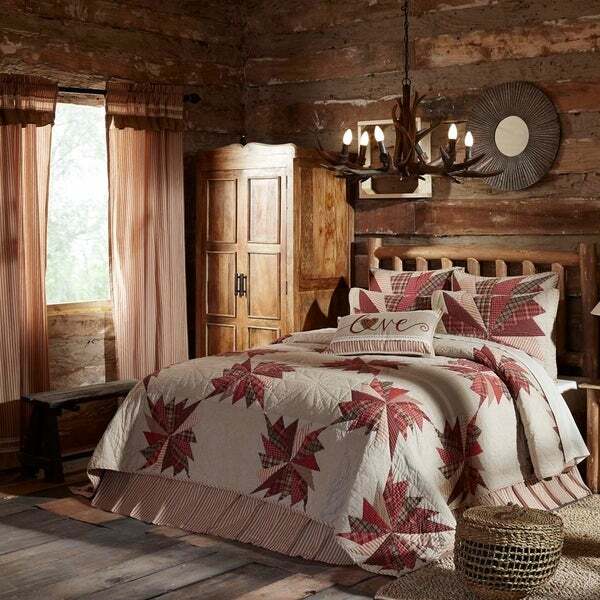 The pinwheel layout of the Ozark Quilt is a rich barn red, beige, black plaid, solid, and stripes embodying a true rustic appeal. The quilt is hand quilted, 100% cotton and reverses to barn red stripes on prairie yellow base. Love this quilt! I was looking for a splash of color for my wall and the rust red is perfect for my house. I highly recommend this twin sized quilt. I loved this quilt so much I bought one as a gift for my good friend. I can't praise it highly enough -- excellent quality, beautiful design. Loved the look of this on the website. But it arrived today and it’s already back at the UPS office to be returned. The pieced quilting is very nice, but the color of the background is just NOT pretty. I expected the background to be off-white to match the pics, but the background looks like a brown paper bag. My husband said it looks like a burlap bag. So disappointed! When I got for my bedroom. From the bed spreads to the Shams to the euro shams. I did order an extra throw pillow not received yet but this sat next to my room look amazing. Great colors! Great quality! Love it! Awful. This quilt arrived damp in the packaging and smelled so foul that I almost vomited. 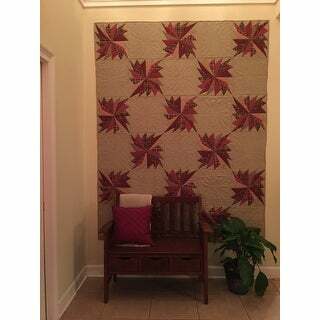 I liked the muted red colors and loved the quilted design. I like the way that the quilt is pieced together and then sewn. I really enjoyed the coupon code also. I wish the “Love” pillow that was shown in the picture was available. I would buy from Overstock again! "Does this come with the Shams and bed skirt or any extra pillows?" It is for the quilt only. I have ordered it but not received as yet. It's a beautiful quilt I'm just disappointed that it is so expensive to have not included the Shams and Euro pillow stuffers. So I ordered them as well. Cannot wait till they come in. Well it finally came in everything that I ordered and it is all perfect. I ordered the quilt is a California king I ordered two king size shams two Euro pillows and just one regular fill out. This is definitely something that I would recommend to anybody who loves quilting.